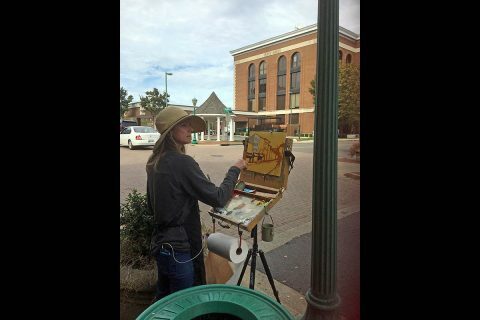 Clarksville, TN – Artists from around Middle Tennessee took advantage of the lovely weather this past weekend as they painted scenes of Clarksville’s downtown and river district in the fourth annual 2Rivers Plein Air Paint-Out. The paint-out culminated with an awards reception, exhibition and sales of work produced through the weekend at the Tree of Life Center. Tiffany Foss on Franklin Street. Tiffany Foss, Franklin, took the first place prize of $500.00, courtesy of Hand Family Companies, for her work, “Franklin Street Blooms,” a creative look at Couture Crush on the corner of First and Franklin streets. Patsy Sharpe, Clarksville, received second place of $250.00, courtesy of Planters Bank, for “Looking Up,” a view of an ancient tree in her backyard. Janet Felts at Spur Line Trail. 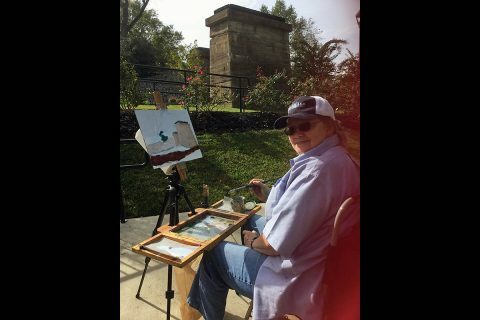 Janet Felts, Erin, took third place of $100.00, courtesy of Heimansohn Steel and Salvage, for “Rock by the River,” painted from a Liberty Park view of the Cumberland. Barbara Joins at Trinity Episcopal Church. 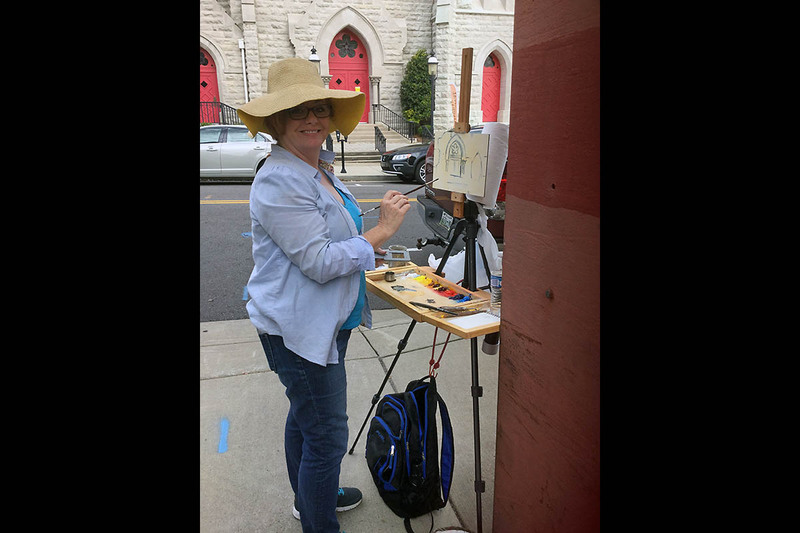 Barbara Joins, Franklin, won an honorable mention award of $30.00, donated by Bettye Holte, for “Red Door,” an image of Trinity Episcopal Church. Foss also won the top honor for the 90-minute Quick Draw competition with an oil painting of the RiverWalk. Respected educators and professional artists Susan Bryant and Billy Renkl, Austin Peay State University professors of art, judged work for the Paint-Out and the Quick Draw.